This 30-page e-book was created to provide fun games and activities that will complement your Animal Moves Junior Deck - the card game that focuses on primal movements of the animal kingdom as inspiration for boys and girls aged 7-to-14 years old. This booklet is a companion guide designed to give parents, teachers, daycare providers and youth coaches additional ideas using the Animal Moves Junior Deck. More Fun: these additional ideas give you more innovative, practical and fun ways to move with the junior fitness deck. It Works Right Away: limited equipment and resources are needed to get going, reducing the barriers to movement. 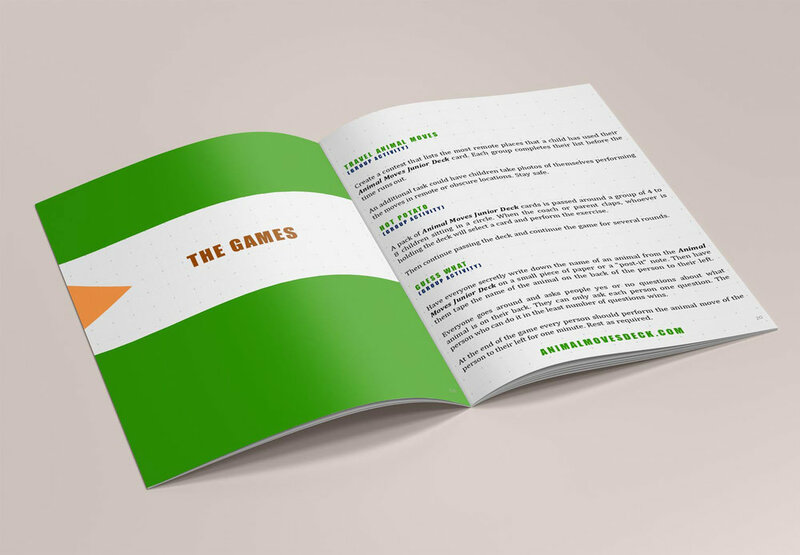 Over 70 Game Ideas: innovative challenges, games and activities to increase the frequency that the deck can be used throughout the day. The activities are designed for solo, partner-based games and groups for up to 60 people. The games cater to kids but have appeal to all age groups and abilities. This booklet is the perfect complement to your Junior Deck but can be used with the Animal Moves Deck (adult version) too.